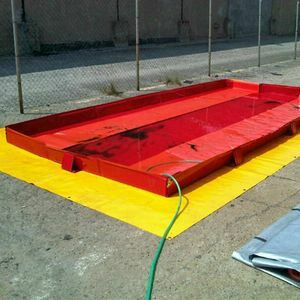 ​​RAW Vehicle Decontamination Bunds are collapsible and specially designed for mobile use. Thanks to their simple assembly, they are ready to use in just a few minutes and are intended for decontaminating vehicles and large appliances in case of an epidemic, transport of animals, etc. 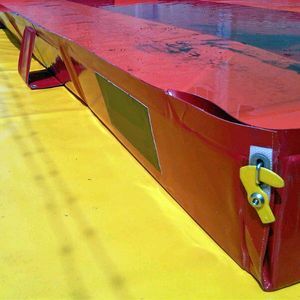 Once erected, Vehicle Decontamination Bunds allow direct access to vehicles, a quick decontamination of several vehicles in succession is therefore possible, for example at check points or exits of closed, contaminated areas. Also very suitable for mobile maintenance works on large vehicles (e.g. in the military field). 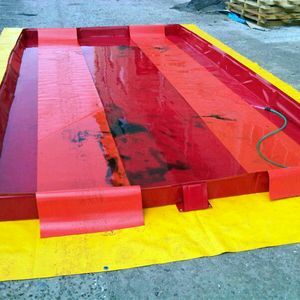 ​In order to extend the life of the Vehicle Decontamination Bunds, they are supplied in a kit with a protective pad and under-wheel tracks that are easy to replace and extend over the whole length of the bund. 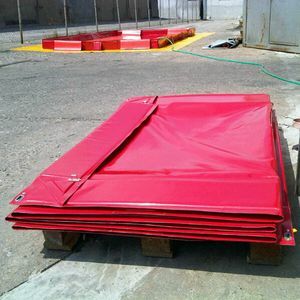 All bunds are manufactured from particularly tearproof polyester with dirt-repellent surface of PVC and are resistant to a wide range of liquid chemicals, especially to common operating fluids such as heating oil, diesel, hydraulic oil, gasoline, etc.